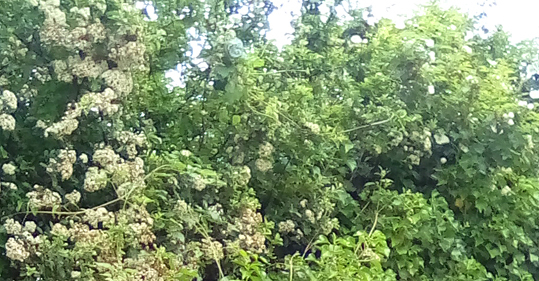 Hedgerows are liminal spaces - where different places meet - and are also traditionally magical locations that allow the mundane world and otherworlds to mingle just a little bit. Pagan Portals - The Hedge Druid's Craft is a new introductory book that forms a similar mingling of magical traditions; an eclectic paganism that blends Druidry, Wicca, traditional witchcraft and a dollop of shamanism. The focus is on developing techniques of shamanic journeying and of viewing this world through an altered state of consciousness in order to see the magic around us. This technique of walking between the worlds is called "hedge riding" in some forms of traditional witchcraft. The symbolism of the hedge as a liminal space is used to help us shift our consciousness between this realm and other planes. The Hedge Druid's Craft blends the traditions of Wicca, Witchcraft and Druidry into a spiritual path that uses the techniques of "hedge riding" to travel between the worlds, bringing back wisdom and enchantment into our everyday lives. It is about working with boundaries, with a foot in either world, living around the edges and working with liminal times and places. For those whose paths meander and often overlap, and those who would not be constrained nor confined by labels, yet who seek some definition, this book is for you. The first section of the book is mostly about how to develop the skills of hedge riding and ways this can be used to connect with the ancestors, deities and the fair folk. The second section moves on to journeying to the shamanic lower, middle and upper worlds via the world tree. Later sections cover traditional plant lore, animal lore, weather lore, folk magic spells and wheel of the year rituals. As an introductory book, it does a good job of explaining some reasonably complex techniques briefly and succinctly. Author Joanna van der Hoeven, who is a Druid, Witch and teacher, has a lovely writing style. The Hedge Druid's Craft is perfect reading for anyone wanting to take their very first steps along the Traditional Witch or Druid's path beside the hedgerows in search of enchantment. Joanna van der Hoeven's earlier books in the Pagan Portals series include The Awen Alone: Walking the Path of the Solitary Druid and The Crane Bag: A Druid's Guide to Ritual Tools and Practices. You can view Pagan Portals - The Hedge Druid's Craft on Amazon. The photo at the top shows a magical hedge near where I live - in an urban part of south London, not out in the wilds. You can find magic in the city too.